I reached Badami railway station by 6 in the morning. A long queue of shared auto was waiting for me. But with my back pack, getting into one of those was impossible. So I paid 100 rupees and caught a normal auto to reach my hotel at the Badami town. It was 4km away from the railway station. The "red hills" was getting visible as I reached the small town. The Puranic story says the wicked asura Vatapi was killed by sage Agastya (as per Agastya-Vatapi story), the area in which the incident happened so named as Vatapi. After checking into the hotel, I took a quick shower. Then, I started my journey to visit the hills. I could see the red hills beyond me. However reaching its entrance was a little confusing. 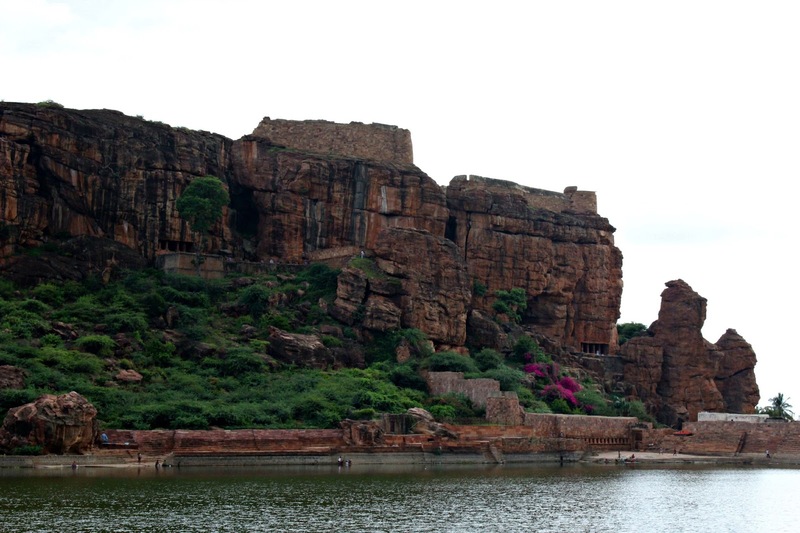 So with my room boy’s help, I reached the Badami cave temple in 10 minutes with a stroll right through the town. It was getting hot and dusty. The road to the cave temples seemed to be isolated, but the city road was lined with houses at both sides. I reached the first cave temple. It was dedicated to Shiva. It has an L shaped open courtyard. It has many fine sculptures. The three interior walls depicted the family of Shiva with Durga-Mahishamardhini, Karthikeya and Ganesha. Another most celebrated sculpture was the eighteen armed Shiva demonstrating the nine postures of Bharathanatya. After taking some pictures I moved on. From the first cave to the next, we have to climb some steps. I reached the second cave. There were sculptured guards or dwarapalakas waiting for me, holding a lotus in their hands. The east and the west walls of the cave had large images of Bhuvaraha and Trivikrama. On the ceiling Ananthashayana, Bramha, Vishnu, Shiva and Asthadikpalakas were engraved. I tried to get some snaps of mine from there, sitting on a bench and positioning the Bhoothnath temple at one corner of my photo. But it was a "Bhageeratha prayathna" to make a click with the visitors who weren’t comfortable using a DSLR. Again after climbing some more steps, I reached the third cave. 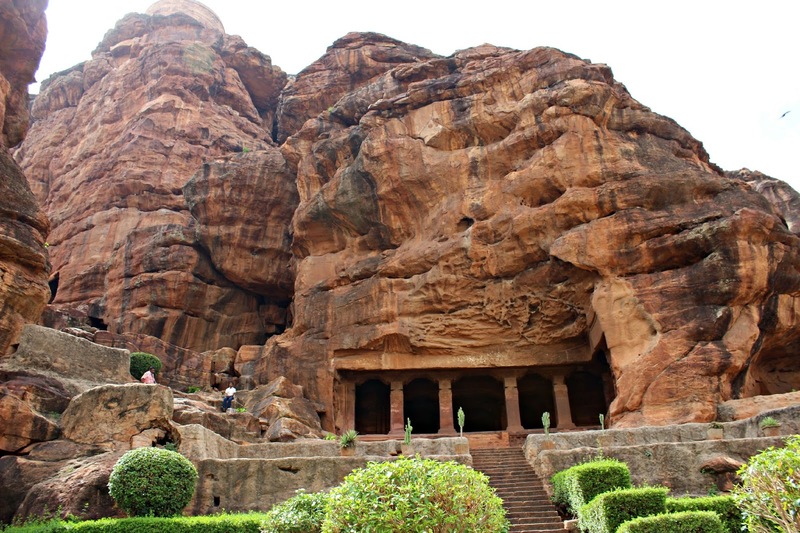 It was dedicated to Vishnu and was the best and the biggest among the cave temples in Badami. It has splendid giant figures of Paravasudeva, Bhuvaraha, Harihara and Narasimha. All these statues were engraved in a vigorous style. There were some paintings on the ceiling and the style indicated maturity. But unfortunately it has long lost its original dazzling colour. From the courtyard of third cave, Bhoothnath's view was little closer. The last one was the fourth cave. It is Jaina and it lies towards a little east of the third cave. 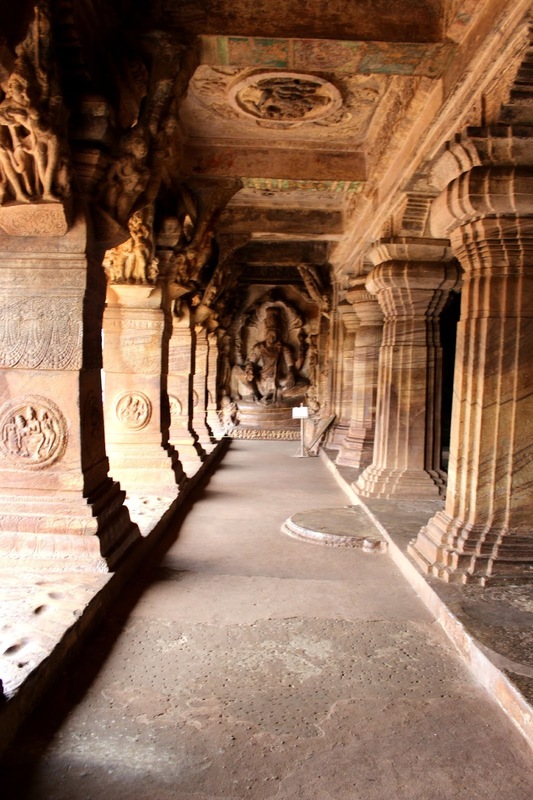 Scores of Jaina Thirthankara images have been engraved in the inner pillars and walls. In addition to it, there were some idols of Bahubali, Yakshas and Yakshis. My next target was to get up to the fort. I looked around searching for its entrance. Finally I found the gate to the top. However it was closed and locked. So I asked the security guards nearby. They said that its closed 13 years back as it is a suicide point. So I argued with them, saying that one of my friend came there, few years back. But the guards shooed me off (politely, of course!) saying that I must be mistaken. 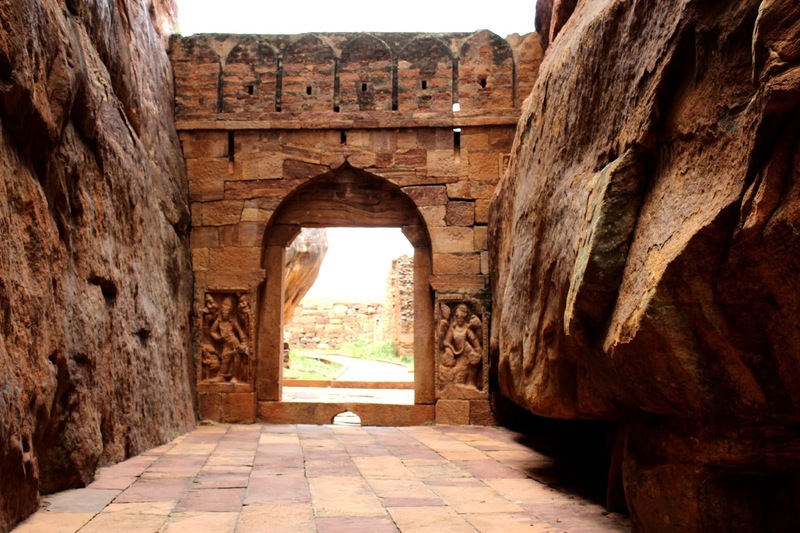 With a little disappointment, I climbed down the steps and moved to Archaeological museum of Badami, dashing through the streets again. With an entrance fee of 5 rupees, they were open, waiting for me with a wide wisdom of the Chalukyans. It was all about the temple architectures they had built and the temples images from and around Aihole and Pattadakkal. It was written in the boards, that the Upper and Lower Shivalayas can be seen if we are ready to trek 1 hour towards the northern hills. I was not only ready but also looking forward to the trekking! The place was a completely isolated one and so no one was around. I could hear only the monkey shrieks in the silent corridors of the rock. I climbed the lower Shivalaya in that silence and I moved towards the top of the hill. Then suddenly, it was a flashy attack! (By the monkeys of course!) I screamed my lungs out, but no one was there to hear (other than the monkeys). The monkeys were getting closer looking at my camera bag! So I thought of using my tactic number two against the monkeys. Running away. (By the way, tactic one was my screech). But escaping didn’t seem a wise decision. So I slowly moved back and traced my tracks back to the lower Shivalaya in less than 30 seconds. Leaving without visiting the northern hills was unthinkable. So I waited till I got some visitors to accompany me. Thankfully I got a couple who were walking slowly towards the hill. I followed them till I saw the next security guard at the top of the hill. In the upper Shivalaya, I met many more visitors, but they were all leaving very soon due to the temperature. 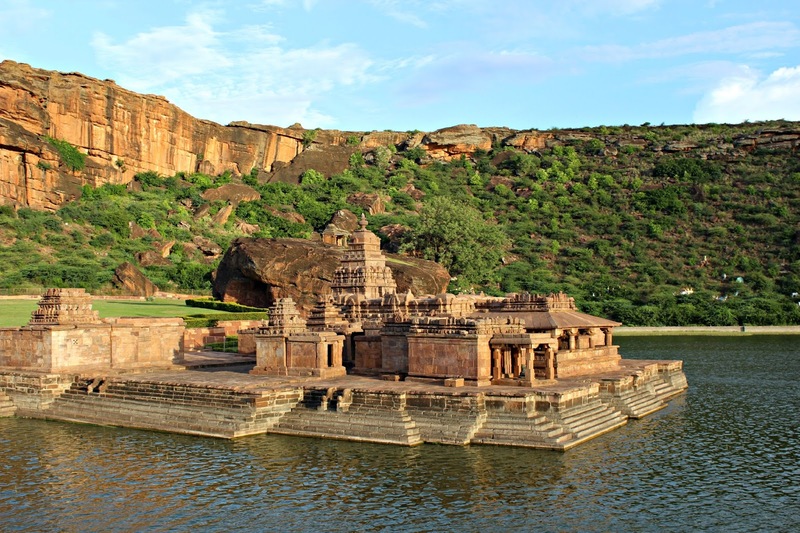 At one side, the upper Shivalaya will give you a breath-taking view of the Agasthya Lake with the four cave temples and at its other side, the Badami town. After taking some snaps I decided to go back. 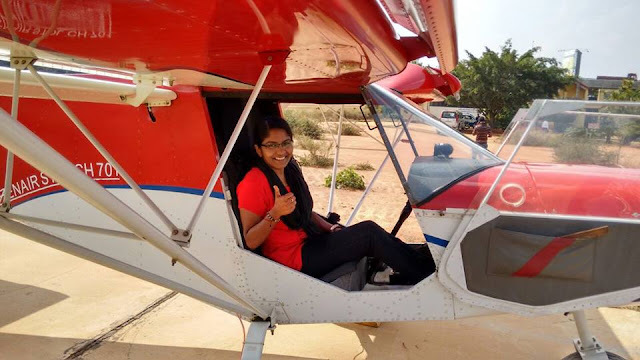 As I was getting down the hill, I met three college girls who took off for a day trip at Badami. They were stuck and couldn’t muster enough courage to get into a crack of rock through which hardly one person could reach the other end. Yeah, I encouraged them to step into the crack and to climb it. But they were hesitant. So I lead them and they followed me. When we got down the hill, they were so excited and thanked me. They even jotted down my number too!!! I postponed my visit to Bhoothnath temple to evening and I got back to hotel. On my way back, I tried with some new shortcuts to reach the town. Drinking a glass of juice (which was my lunch), I curled up in my bed to watch a movie in the TV till the temperature outside reduced. When the temperature reduced a bit, I went out and took another 20 minutes’ walk, back to the Agasthya Lake shore. It was around 3.30 in the evening. My intention was to get to the top of the hill as I had read in one blog. So I searched for a kid who could help me. Bhoothnath is the finest attraction at Badami. You can’t take your eyes from the temple and its glowing glory in setting sun. I mistakenly found a wrong kid for my short "trekking". But after one hour, I found the right kid who knew the way and they both helped me reach the top of the hill. With my height, hiking was a little difficult. During the hike, my foot got stuck in between the rocks once. I would say that the view from the top of the hill was worth the effort. After a few more clicks from the hill top, I climbed down the hill and paid the kids. But I wasn’t mentally ready to leave the Boothnath Temple yet. 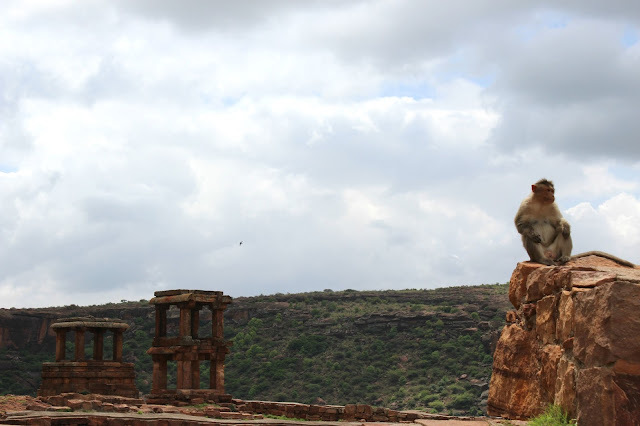 May be that was the monument in Badami, I spent most of my time. The next day, after returning from Aihole, I spent another two hours there. 1. Malayalam talking Chaudri at the ticket counter. 2. 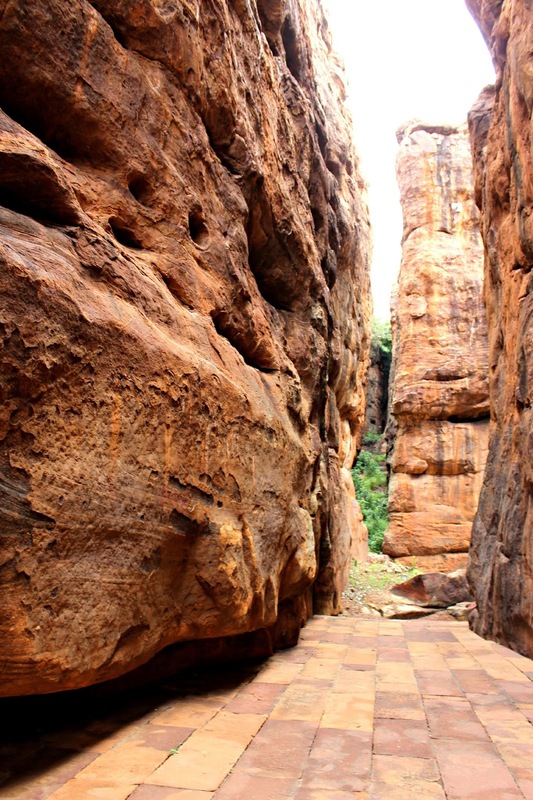 If you are staying at Badami town, you don’t need any guide to roam around if you are willing to walk around. 3. Street foods are at its best if you are ready for an evening walk! 4. A Malayali's bakery at town! 5. Local market is so active despite the hot temperature, that you can buy fresh fruits and vegetables as your "meals". 6. Lots of vegetarian restaurants are around the place. 7. Very frequent local transportation to nearby places like Pattadakkal. Pattadakkal - Red Town of Chalukyans! How I afford my journeys?? ?